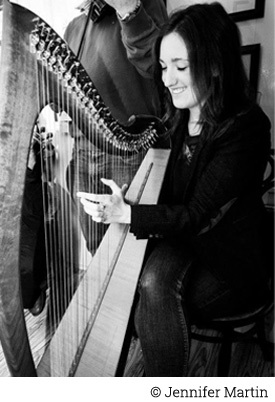 A beautiful first impression to your day is for your guests to arrive to the sound of the harp. Wherever the ceremony is being held, the sound of the harp immediately sets the scene and helps put your guests (and possibly the groom!) at ease. All religious and non-religious ceremonies can be catered for. This is a time for guests to relax and catch up and live background music can add to this ambience. 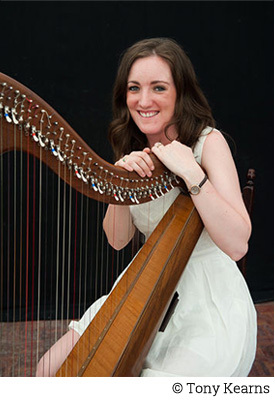 The harp is perfect for background music as it will never be too loud for guests to continue with their conversation. However for larger crowds or rooms an amplifier (provided) can be used to ensure that the sound is not lost. Cathy can also play during the mealtime. Generally during this time the harp is amplified to allow the sound to travel across the room. In some venues the harp can be played directly through the room's speakers. "No words can describe the emotion I experienced when walking up the aisle with my Dad to meet Colum."